The Beach Boys (and Capitol Records) issued three separate albums in a seven month period in 1963, Surfin’ U.S.A. in March, Surfer Girl in September and Little Deuce Coupe on October 21. That’s a lot of surf oriented vinyl on the market in such a short period, all the more so considering the band’s debut album, Surfin’ Safari came out in October 1962 (making it four albums in 12 months!). But the rebirth of rock ‘n roll and Beatlemania were in full swing in the summer of ’63. America’s youth craved anything with a beat and harmonies with young studs to sing them. 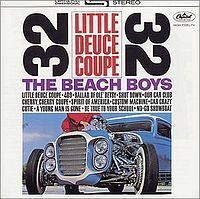 Capitalizing on the Beach Boys’ growing popularity was a smart decision with generally positive results; Little Deuce Coupe spent 49 weeks on the Billboard pop music chart, peaking at #4. Interestingly, the three best songs on the album, the title track, “409” and “Shut Down” all appeared on the previous albums, but the public didn’t seem to mind. To view and download my Beach Boys playlist from the Playlist Vault at DrRock.com, click here. Little Deuce Coupe is available as download tracks from iTunes (click here) and as a CD from Amazon (click here).